Panini Copa America is the third official album dedicated by Panini to the Copa America after the editions 2007 and 2011, the first with the hardcover album. The album opens with an introduction about the program of the competition. 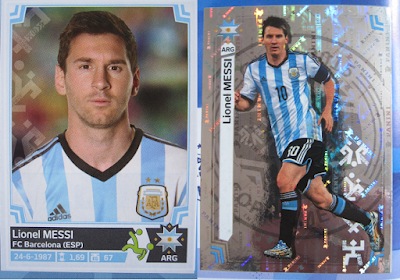 This page includes four stickers: the Copa America logo (two stickers), mascot and stadium of the final. Then the locations of the Copa America 2015 (Chile) are presented in a double page. For each of the 8 locations there is a sticker of the venue and a sticker of the stadium. Then the 12 teams included are shown based on the three groups of the competition. Each team is displayed over three pages with a total of 23 stickers: the team photo (2 stickers), the shining national badge, and 20 players. Chile hosted the competition and also won the trophy defeating Argentina in the final. Bolivia passed the group and lost in the quarter finals against Peru (1-3). Argentina was expected as one potential winner. They reached the final, but lost at penalties against Chile. Uruguay was out in the quarterfinals, whereas Paraguay defeated Brasil and reached the semifinals before losing against Argentina. Brasil was a big disappointment as they lost in the quarterfinals (against Paraguay) same as Colombia (against Argentina). Much better tournament for Peru, who reached the semifinals and lost 2-1 with Chile. The last part of the album includes the best players in action. 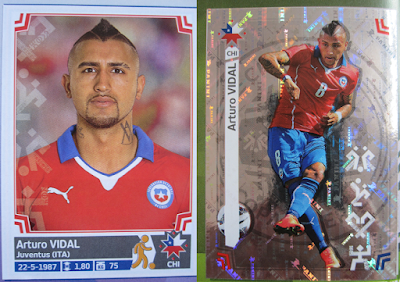 There are a total of 50 stickers of players in action out of which 12 are shining. The last page of the album presents the roll of honour of the Copa America and two stickers to compose the trophy of the competition.